Cameron Beyer spotted an experiment that simplifies the interface for Google Suggest and adds Google's search buttons below the list of suggestions. 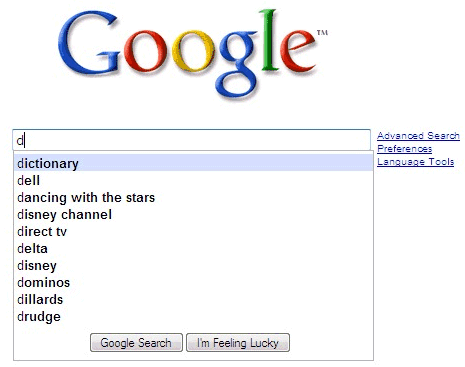 This is not the only experiment for Google Suggest: other changes include the direct access to the top result for navigational queries, direct answers and suggestions from your search history. Since many people replaced the address box from their browsers with Google's search box, it's natural for Google to make the search box more powerful and to provide even faster access to search results. If Google's search box first became ubiquitous through Google Toolbar, then Google Toolbar's search box evolved into Chrome's Omnibox, the added functionality should now be included in Google's homepage. Where do you guys get these early screenshots and whatnot? It doesn't matter where it comes from Alex brings it quickly. This is a great feature instead of waiting us to type all the characters it shows good options to choose from. Google Suggest has a HUGE gaping security weakness. Once a blackhat SEO manipulates/games the results to display a desired Google Suggest result, the unpopular suggestion that was manipulated into the suggestion list will almost certainly first become a "popular" suggestion. With all the brilliant PhD's running around Google Labs, someone from the Google Suggest team really ought to read Robert Cialdini's classic behavioral psychology book Influence (see Chapter 6 on Authority: Directed Deference) to learn how others can be manipulated into behavior by false displays of authority. Google Suggest is flawed, encourages manipulation, and is a very dangerous weapon that can easily and recklessly abused by competitors in hand-to-hand combat. This kind of issue is screaming for attention from U.S. DOJ, FTC or State Attorney General(s).